The conversation about tankless water heaters is often focused on consumer needs but the truth is that they can be a great option for commercial businesses too. Keep reading to learn about four of the ways your company may benefit from making the switch, then contact The Stanley Louis Company at 800-217-6527 to learn how we can help you find the right options for your particular needs. First and foremost, the biggest advantages of using a tankless water heater is that it will help you spend less money on hot water. A tankless unit runs more efficiently than your traditional water heater, and they cost less to run. You actually get savings twofold. First, you save money because the tank is more efficient when it’s heating up the water. Second, you save money because the tank only heats up water when you need it. The average traditional water heater will keep heating water whether it’s being used or not. In fact, it will heat water over and over again to ensure there is hot water on standby – even in periods where very little hot water is needed. A tankless system only heats water when you need it and thus offers significant savings. The fact of the matter is that any traditional water heater, no matter how big the tank is, is going to eventually run out of water if enough hot water is being used at the same time. However, when you choose a tankless unit that has the right capacity for your company’s needs, you will not run out of hot water. The unit heats water when it’s needed instantly. A smaller business can get a single residential tankless unit while larger companies may install several larger, commercial grade tankless water heaters. We can help you find the right choice for your needs. 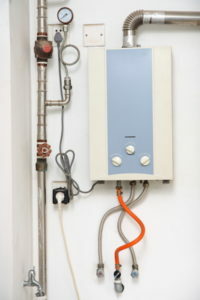 Tankless water heaters are energy saving appliances and considered green technology. This not only helps you feel good about your contribution to protecting the environment, but it is likely to appeal to many customers as well. If you are trying to qualify for LEED credits, or gain access to environmental state or federal tax rebates and other incentives, a tankless water heater can help. There’s no question that every appliance you install will wear out at some point. However, tankless water heaters are extremely low maintenance and they generally last for years longer than the average traditional water heater. This is yet another way you will save money in the long-run. If you are interested in learning more about the cost and process of installing a tankless commercial water heater, contact The Stanley Louis Company at 800-217-6527.